Do Amish use solar power? A year ago I noticed a stark change while in an Indiana Amish community. Solar panels and spinning wind turbines had populated many an Amish roof in the 5 years since I’d last visited. Later, in an Amish-owned store in another settlement, I viewed an array of technologies designed to harness the wind and sun. Amish, at least in some places, are taking up these technologies designed to latch onto the forces of nature. A recent article looks at the first Amish household to adopt solar power in the community at Lyndonville, New York (Orleans County). Jonas Miller may be setting a trend for his community, where the church has officially sanctioned the technology. High diesel prices have driven the change to solar, which will be used “to power the lights, cash register and other electrical needs for his general store” in his community of two dozen families. Not all Amish are agreed on solar, as the article notes. On the one hand solar and wind seem like they’d fit the Amish (or at least the popular perception), being “pure” power sources derived directly from God’s natural abundance. On the other, the appearance of solar technology just seems a little on the high-tech side. 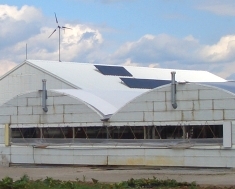 Sleek solar panels still look starkly futuristic and out-of-place attached to 19th-century Amish barns. Perhaps this is why some Amish groups balk at the idea of solar. Also, if a technology is adopted by a higher (less traditional) Amish group, that in and of itself can be enough to make lower groups resist signing on to it. Do you use any solar technology? The only piece I own, besides an old calculator somewhere, is a little yard lamp, the kind popular among Amish, purchased in an Ohio Amish store. Amish are ahead of the curve here (or at least ahead of my curve). It will be interesting to see to what degree Amish incorporate solar and wind technology. Maybe one day we’ll observe Amish buggies rolling down the road, plastered with solar panels, or with whirling wind turbines planted on their roofs. Or maybe not. 19 responses to Do Amish use solar power? I have a couple of outdoor lights, that is about it. But on an interesting note, while I was camping in Bellefonte, PA this past summer I noticed several of the Amish farms did have small solar panels placed around their property kind of out of the way. They did not have the rather large panels you typically see on roof tops. I am hoping within a year or two to add solar panels here if finances allow. Time will tell. This is also a good area for windmills as the wind is usually blowing in off the prairie. I am all for going more natural with my energy source even if it is considered “high tech”. Interesting observation Alice, I think Amish aesthetics will push these to less obtrusive locations when possible given sun angles and so forth. Solar panels are kind of ugly (even if you’re not Amish 🙂 which I don’t think gets talked about too much. However that is just one factor in the decision to use them. Responding to Alice’s comment… Here in Central PA I’ve noticed an uptick in the use of Solar amongst the more “modern” Gray and Black toppers, mostly in Penn’s Valley and further East as well as the use of LED’s on their buggies. Still, many Amish run shops around here mostly use skylights, kerosene lamps and some diesel generators. Still I wouldn’t be surprised If I started seeing solar panels and wind turbines amongst the more “primitive” old order Amish in Big Valley. The way the Amish adopt technology is often surprising. I for one am happy to see “green” technology anywhere it can be used. Very interesting Lowell, thanks for this info. Your post also reminded me of the gigantic wind turbines in Van Wert County, Western Ohio near the Indiana border. Not the same thing as what you are talking about, but wind power tech on a much larger scale. I have a weird association with these turbines. I’ve driven past them the past two years while traveling to the Allen County, IN Amish community. Merits of wind technology aside, and going purely on the matter of appearance, personally I don’t think I could ever get used to the sight of these if I lived near such an agglomeration. It’s not just that they interrupt the view–I find them slightly disturbing on a level I can’t quite put a finger on. There’s something ominous about them. Perhaps it is their massive size combined with the fact they move at such speeds but nearly silently (at least in relation to what you’d expect for something so large). But maybe I am just odd. VAN WERT: The 411-ton turbines reach to the skies to catch the best winds high above the soybean and cornfields that dominate the flatlands of western Ohio. They are taller than anything in Northwest Ohio: five times taller than the biggest farm silos in Van Wert and Paulding counties and taller than any buildings 80 miles away in Toledo. The towers rise 328 feet from the bases to the hubs where three blades, each 148 feet long, attach. With blades upright, the turbines’ height reaches 476 feet. That’s another 14 stories higher than Akron’s tallest building, the 330-foot FirstMerit Tower. Welcome to Van Wert County, which is becoming the Wind Capital of Ohio. In all, 210 wind turbines are dotting the rural landscape along U.S. 30 near the city of Van Wert, and at least 550 more are planned here and in surrounding counties. Each one costs about $2 million and can supply enough energy to power 500 typical Ohio homes. When I was a full time RVer several years ago, they were a hot item on Travel Trailers for people who wanted to stay in places where there were no power hook-ups. I never had that installed on my trailer because the prices were high then-they were just coming out. Now the Amish have it. It sure has come a long way. Their ancestors founded the first “free church” in Europe, in 1524. They had the best up-to-date farming knowledge. Because of that, the Bavarian king invited the Amish to immigrate to Bavaria in the early 19th century. They should bring modern agricultural knowledge to Bavaria. Since the upcoming of the wireless information technology, the main danger for community living is not the electric wire anymore, so it is only logical, that the Amish community is using the solar and wind power to make the farms and businesses even more selfsufficient. The decentralization of the energy market will strengthen the rural communities. We’ve noticed quite a few schools down in the Shipshewana Indiana area that have solar panels on the roof’s. We commented on this exact thing a few weeks ago when we visited the area. I too, have noticed the growing trend of Amish and solar panels. I myself would like to add a rooftop set of solar panels, but current market value of such items is out of my reach. I love the concept of solar power. But I’ve never lived in one place long enough to be able to implement it in my personal residence. Hans Georg, thanks for clarifying that it is the wire connection to the outside world that led the Amish to reject electricity, and not the form of energy per se. just barely (dull) for a short length of time. I also have a solar fountain (summer use, only), but it only works when the sun is actively shining (no battery, just “direct” solar current). I will also like to keep up with news about the Amish “adoption” (or not) of solar/wind technology. It certainly seems like a “fit” for them, as long as they can remain off the grid. However, I know that people “sell” excess wind power (don’t know about solar) to the local electric company—in some places, I think they’re REQUIRED to. Erik, please comment or “ask around” about the idea of Amish “selling” their own solar/wind power to “the grid” and if any do it yet, or just their thoughts on it in general. That’s a good question Alice Mary, I have not heard anything, though I don’t know that they are dealing with much higher capacity beyond home usage amounts. Maybe this is a future business model for some land-owning Amish once solar becomes more entrenched. I have had limited experience with solar panels / appliances, but there is one application where I have used them with success. I sold my cow herd a little over a year ago because of the ongoing drought in the southwest, but for about the past ten years before that I leased land up to 100 miles away from my home to graze cattle. Many of the places I leased had old, worn out fencing which was often beyond repair. Whenever the landlord wouldn’t agree to replace the fence I would put in a provision in my lease agreement that said I could supplement the fence with an electric fence inside of the exisiting perimeter fence. Problem being that most of the places I leased weren’t within 5 miles of an electric line. So I purchased solar powered electric fence chargers. If you buy a high quality unit, they work like a charm. The battery needs to be replaced about every three years, but otherwise they are pretty much trouble free. The last time I was down there I noticed the the Amish community in Beeville, TX used solar fence chargers, too. You might enjoy a 1-minute video clip of a solar green buggy, a new invention, from Nov. 2011, decorated for a Christmas parade. www.youtube.com/watch?v=hw8gtxoXDA4 (Larry & Kayden on Solar Buggy). This is a “buggy” powered by 4 solar panels, all electric drive. Don’t expect a horse here; it’s powered by solar. I presume they call it a buggy because it has two wheels. We have used a solar water heater to make cold water hot. The hot water was free except for paying for a little electricity to run a small circulating motor, and after the initial expense. I would imagine that the use of solar power varies from district to district and that some bishops will be more open to it than others. My son, Mark, has three solar panels. Two are hooked up, in-line, to charge the deep cell battery he uses to power his sleep apnea machine. The other solar panel is out by the barn and he uses it to charge his buggy batteries. The buggy batteries are for the LED lights on his buggies. Mark opted to mount his solar panels on frames fastened to wooden skids on the ground. He was leery of mounting them on a roof. He said, “Dad, whenever you screw something into your roof you make a hole. Where there’s a hole you have the potential for a future leak.” Smart son. But, then again, I taught him everything he knows. Don Curtis, Mark (and of course, YOU, as his Dad and teacher) are so clever! I never thought of putting a solar panel on skids—I suppose I’d be able to move it around the yard to catch the sun’s rays optimally (per season). Now, if I only knew what else I’d need to actually use & store the power. Batteries of some sort, I guess. What kind does Mark use for his buggy? I could use some light in my shed, for example, or as a “security” light in the yard at night. I just don’t know what I’m doing (is there “Solar Power for Dummies”?). I’m just now finding this website. Such great material to read. I’ve lived in the state of Delaware my whole life and Amish have always just been there. Recently I’ve had the pleasure of working with an Amish crew installing my roof and hoping to get on their schedule for a huge renovation… anywho Mr. Yoder was using a cell phone and I asked him how he charges it and he said he has solar power. I was shocked because I have never seen that on any home in the community. The guys have 1-2 “English” workers that drive for them. Thanks for all the sharing. Loved reading about my own local community. Glad you found us Angel! Yes smartphones and solar hardly seem “Amish” to a lot of people but truth be told these are present to varying degrees in many communities. Leave a reply to Do Amish use solar power? Do Amish celebrate Valentine’s Day?